Note: Only suitable to use in the following areas: Britain, Germany, France, China, Singapore, Hong Kong (200V), Italy, Spain, Greece, Austria, the Netherlands, the Philippines, Thailand, Norway, Singapore, India, New Zealand, Australia. 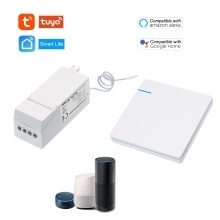 This item includes one wireless switch transmitter and one receiver. Unique code of each switch transmitter activates only the intended receiver(s). Multiple units may be used in the same home without interference.The low radiation,wide signal transmission range and energy saving functions makes it widely used in many places. *Control the way you want it. One button on the switch can control an unlimited number of receivers that are in range. One receiver can respond to up to 8 transmitter buttons. *Low radiation. Less radiation than the smart phone and WIFI devices. *Reliable range. Unique code of each switch transmitter activates only the intended receiver(s). Multiple units may be used in the same home without interference. *Wide signal transmission range. Over 500 meters(1640 feet) in open space, over 40 meters(131 feet) indoor. *Saves energy. 0W standby consumption for the switch, standard battery CR2032 can work long time. *Rolling code technology. With millions kinds of address code combination, make no repeated code. *Polycarbonate(PC) material. High stability and flexibility, flame-resistant and reliable.